The Greek word See'-mone (Simon) is a proper name and has no hidden meaning. The name comes from the Hebrew name shim-one' which simply means "hearing." The Gospel of Mark cites the name six times. After Jesus "lays on a new name" to him, the gospel never refers to him solely as Simon ever again. See the chart below. Simon Petros is mistranslated in English bibles as "Simon Peter." He appears throughout the Gospels as the leader of the twelve disciples. The name Peter is a phonetic translation - it is the only English name that most closely sounds like Petra or Petros. The name Peter has nothing to do with and does not reflect in any way the literal meaning of the Greek words Petra or Petros. 01:29 And immediately coming out of the synagogue they went into the house of Simon and Andrew with James and John. 01:36 And Simon and the ones with him searched for him. 03:16 And he layed on a Name to Simon ... The Stone. 14:37 And he comes, and he finds them sleeping, and he says to Stone, Simon, are you sleeping? His original name was Simon, but Jesus gave him the Greek title or nickname Petros (petroV) meaning "the Stone" (Mark 3:16). The title is a multi-faceted metaphor. Greek uses two different words to denote a stone and a rock ... the masculine petros and the feminine petra. In Vine's Expository Dictionary of Old and New Testament Words (1981, Vol. 4, p. 76) "Petros denotes a detached stone or boulder in contrast to petra, a mass of rock." Calling Simon a "Stone" is a metaphor like saying a person is "a chip off the old block" or "a rolling stone." Another commentary says "In classical Greek, the word petros means a piece of rock, as in Homer, of Ajax throwing a rock at Hector or of Patroclus grasping and hiding a jagged stone in his hand" (Word Studies in the New Testament by M. Vincent, 1957, Vol. I, p. 91). The meaning of Petros as "a movable stone" (Heracletes uses it in the phrase "leave no stone unturned.") sets up a pun in Matt 16:18 where Jesus says to Simon ... "you are Petros (a moveable stone) and upon this Petra (a large unmoveable rock) I will build my Ekklesia" (Assembly). The word petros seems to be a pun on petra but it actually refers to ekklesia. The meaning is that Petros is just one stone in an assembly of stones. The assembly is built on the immoveable Rock that is Jesus. Another Matthean pun (Matt 14:22-33) sees Simon as "a moveable stone" that first walks on water then later sinks because he has "such little faith." 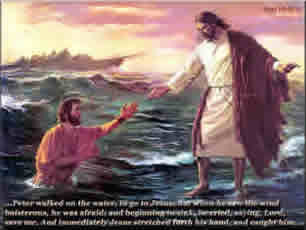 Simon was also a great fisherman who successfully "moved" Jesus and the other 11 disciples around the Sea of Galilee. These gospel stories metaphorically made Petros into a movable "stone" or "boat" that took Jesus where he wanted to go. Mark: Verses that cite "The Stone"
05:37 And he did not permit anyone to follow with him, except the Stone, and James, and John the brother of James. Having answered, the Stone says to him, you are the Christ. And stepping in front of him, the Stone began to rebuke him. But having turned around, and having seen his disciples, he rebuked Stone, and he says, Go away behind me, Satan. And after six days Jesus takes the Stone and the James and the John and he carries them up into a high Mountain each privately alone. The Stone began to say to him ... Behold, we left everything and have followed you. the Stone says to him, Rabbi, look, the fig tree which you cursed has been withered. 14:29 But Stone said to him ... And even if everyone will fall away, yet I will not. And he comes, and he finds them sleeping, and he says to Stone, Simon, are you sleeping? The Sign of Simon "the Stone"
The name Simon is a Proper Name. The word Petros is a Title meaning "The Stone." The gematria value of the name and the Title together form a Sign that is a geometric multiple of the Raised Jesus (8880). The name Simon has a gematria value of 1,100 units. The word petros is a masculine noun and takes the masculine definite article "O." The title therefore has a gematria value of 70 + 755 = 825 units. The name and title have a combined gematria value of 1925 units. The diagram below reveals Simon Peter's sign. Exactly four circles, each with a circumference equal to the gematria value of Simon the Stone (1925), fit inside a hexagon inscribed in the raised Jesus (8880). The blue circle inside the hexagon represents the "Sea of Galilee." The gematria value of Simon the Stone (1925) is a geometric multiple of this "Sea" and of the Greek word "Fishes" (1224) as can be seen in the short essay that further explains the Sea of Galilee. Simon "the Stone" was a fisherman from Bethsaida and he and his brother Andrew were called by Jesus to be disciples at the same time as the fishermen James and John, the sons of Zebedee (Mark 1:1620). Christianity began with the dawn of the Age of Pisces and the fact that Simon Peter, James, and John (the most trusted apostles of Jesus) were all fishermen led to the adoption of the fish as one of the most imortant symbols of Christianity. 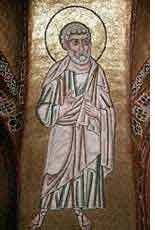 Simon Petros figures prominently in many gospel stories that were geometry riddles.